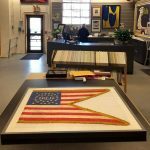 We took the Civil War-era 1st Rhode Island Cavalry guidon flag to Crestar Picture Framing today for a professional display. In these images, Tony Scelsa takes precise measurements for the new frame. We plan to mount a plexiglass sheet with museum-quality ultra-violet protection over the flag’s existing archival-safe matting and frame. 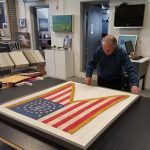 The treated plexiglass will protect the flag from light damage and will keep curious fingers and dust off of the cloth. The display’s backside is open to the unbleached linen backing to allow the flag to breathe. 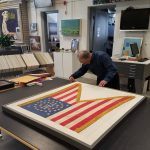 While the custom framing is ordered and built, the flag will be professionally cleaned previous to display in the Varnum Memorial Armory Museum. 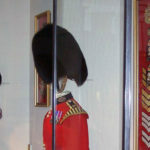 To book a tour of the Armory’s military history collection, just click here.